Check availability, prices and book a fast boat from Bali to Penida by using the search box above. You will be sent etickets immediatly after payment and El Rey Junior fast boat company will email you seperately confirming your trip details and (if requested) the pickup time from your hotel. While Penida has previously been a less well known destination, it's starting to become more and more popular among travellers. With it's stunning coastlines and undsoilt atmosphere it's no surprise why. El Rey is a new fast boat company exclusively servicing Nusa Pendia from Bali Sanur harbour. Once booked, don't hesitate to use the contact information on your tickets to reach El Ray with any questions you might have. El Rey operate out of Sanur beach in south Bali (near Denpasar) and offer 3 daily crossings from Bali to Nusa Penida and back. The total crossing time is about 1hr 15 mins. If you select the ECONOMY PLUS ticket type from the search results, Free Bali hotel pickup is included from Sanur, Kuta, Ubud Central, Canggu club, Jimbaran, Airport, Nusa Dua Central and BTDC. Otherwise you can opt for the cheaper Standard Economy rate (excludes transfers) and arrange your own transport to/from Sanur harbour. Pick-up/drop-off outside of the before mentioned areas or on Penida are available for IDR 75,000. 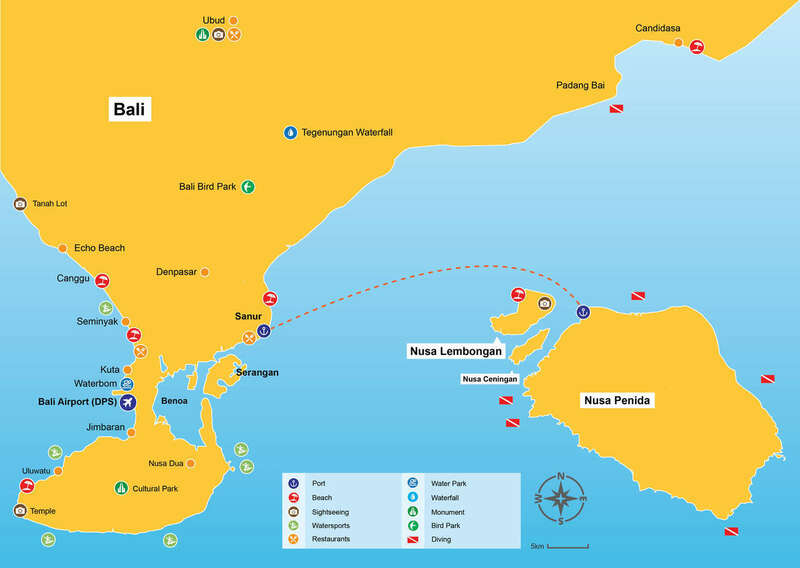 Departing Sanur Beach*: 08:00, 10:45 and 15:00. approximate sailing time: 1hr15mins. Departing Penida: 09:15, 14:15 and 17:00. * Free pickup & drop off is offered to ECONOMY PLUS ticketholders from/to many south Bai locations such as Kuta, Legian, Jimbaran, Ubud Central, Sanur and Nusa Dua. Pickup typically takes place around 1hr30mins before departure time. Exact details are emailed after booking when you enter your hotel address in the appropriate field of the booking process.